Thomas owes John $18.80 but he wont see him anymore. 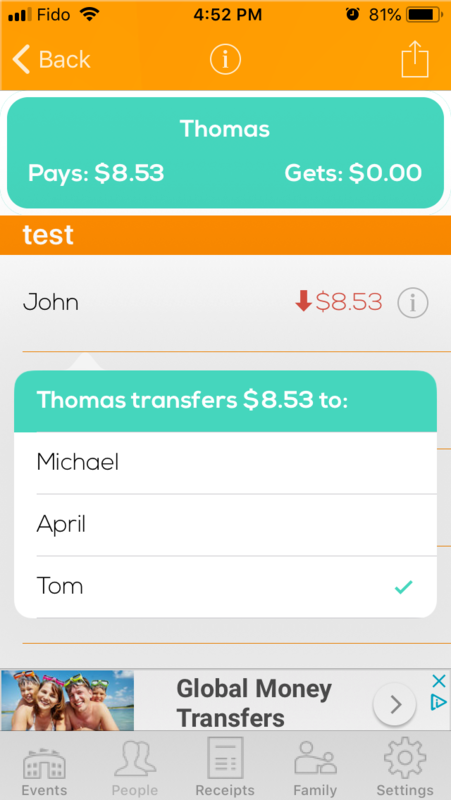 Let’s transfer the $6.25 to Tom (John’s brother). Thomas works with John and sees him everyday at work.Now Thomas owes John $18.80 more and John owes Tom $18.80 more but Thomas doesn’t owe John a dime. A share cannot be transferred to a family member. If a family member is transferring to you, his/her head is actually transferring to you. If a family member is transferring to another family member, two heads are the people transferring and being transferred. Smart Transfer: The app is super smart that when is going transfer, the app does not show any members .